Be sure and check out the following beer-related vendors and displays at the festival! Bottle Tap: Unique, custom-designed bottle openers. Brewvana: Portland Brewery Tours and Festival Concierge, offering info on beers, breweries, and daily Beer 101 sessions and Tours de Beer. Cascade Breweriana Assn: Beer memorabilia from the past. 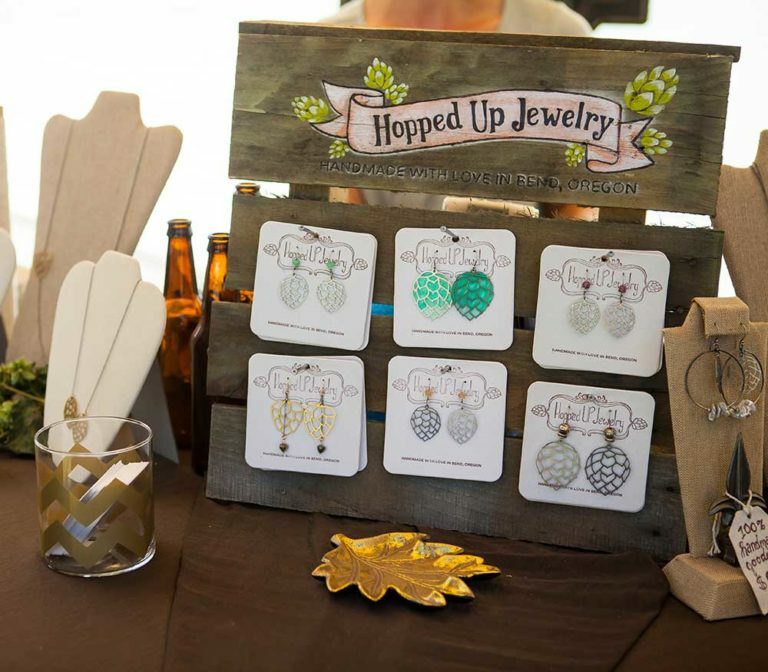 Hopped Up Jewelry: Handmade beer hop flower earrings & jewelry for craft beer enthusiasts, made with love in Bend, Oregon by creator & designer, Kimberly Markley. Linda’s Temporary Tattoos: Handpainted temporary body art. MV Marketing: Resort promotions via fun and games. New Avenues for Youth: Promoting Brews for New Avenues, Portland’s craft beer event for a good cause. Visit the Brewers Dunk Tank! OBF Souvenirs: Oregon Brewers Festival official merchandise. Olive Branch: Gourmet Olives, Pickled Garlic, Pickled Veggies, Olive Oil, Vinegars, Margarita Mix, Bloody Mary Mix and Olive Juice. Oregon Brew Crew: Oregon’s oldest and largest home-brew club will be chatting with attendees and doing homebrew demonstrations. Oregon Brewers Guild: Selling S.N.O.B. memberships and T Shirts for Supporters of Native Oregon Beer. Oregon Lottery: Games and activities promoting the Oregon Lottery. Portland Timbers Street Team: Portland Timbers Street Team offering games and giveaways: onsite July 26 and July 27 from Noon to 5pm. Stumptown Kilts: Men and women’s modern utility kilts and accessories.